The dynamokos series aims to build a dynamic distributed web application on the top of OSGi. The first version relies on Apache CXF DOSGi to distribute OSGi services as web services. The first framework hosts an Oracle. The Prediction Service (provided by the Oracle) is published as a web service using CXF. The second framework imports this service, and a web application uses it. The main issue in this application is the ad-hoc importation. The importer indicates to DOSGi the location of the Prediction service. But nobody checks the availability of the service. So, despite a potential unavailable Prediction Web Service, the web page tries to use it. The Zookeeper Discovery is a bundle (also developed in Apache CXF DOSGi) interacting with the Zookeeper server to publish and discover remote services. We use the Apache Felix Configuration Admin to configure Zookeeper. Some rely on centralized registries (like in Jini), some just on network events. The OSGi Distributed Service specification defines how the Distributed Service implementation (in our case DOSGi) deals with Discovery Services without imposing any discovery protocol. That’s pretty nice as we can use a lot of different discovery protocols (depending of the use case). In Dynamokos, I decided to use (at least for the time being) Apache Hadoop Zookeeper as discovery protocol. The good news is that DOSGi supports it. Zookeeper is a high-performance coordination service for distributed applications. It exposes common services – such as naming, configuration management, synchronization, and grouping. Zookeeper will be used as a global registry publishing services exported remotely. But before being able to use it, we need to launch it. 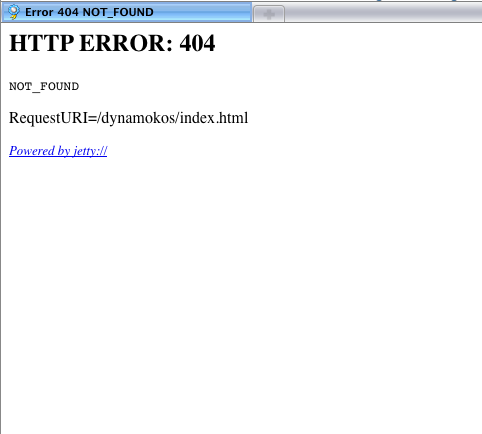 To this end, download the dynamokos-runtime archive from here. Then unzip it and go (with a terminal) into the runtime folder. Note: Zookeeper requires Java 6. Let’s now try to publish our Prediction Web Service into Zookeeper. No code required! The only requirement is to deploy the Zookeeper discovery service and to configure it correctly. This org.apache.cxf.dosgi.discovery.zookeeper.cfg file will be read by Apache Felix File Install and pushed to the OSGi Configuration Admin. Then the configuration admin pushed this configuration to the Zookeeper discovery service. Once received, this service is able to contact the Zookeeper server to register the Prediction service. It’s time to configure the client platform to discover the remote Prediction service. As we are using Discovery here, there is no static remote service metadata required. So no remote-services.xml file. Discovery will dynamically inform DOSGi of the locations of available remote services. The DOSGi implementation will in turn register proxies for the remote services in the local service registry. So, this completely avoids the static import. This launches the client platform with the zookeeper discovery service (configured with the same configuration). Note, that there is no more the oracle importer bundle, as the static configuration is no more required. Now, you can ask metaphysical questions to the oracle. Ok, that’s nice but we haven’t even seen the really interesting stuff. Go back to your browser and update the page … 404! The Prediction service is withdrawn from Zookeeper. And then, refresh the page… our oracle is back! That’s the content of the next post. Stay tuned! If you have questions, feel free to post a comment on this post or to contact us. Great post, but I got this problem as attached, may i know how to solve this? Hmmm – looks like there is an issue with your classpath. And it also looks like the …\zoo.cfg argument before ‘start’ is incorrect. The idea is to trigger a notification when a new service is exposed and to configure the firewall and the router. A lot of firewalls and routers can be configured using web services and rest endpoints making easy to configure remotely. We have already deployed such mechanism where the notification was propagated using JMS. But what about the endpoint ID published by the machine exposing the remote service? The ZooKeeper entry should contain a reachable ip address and not a private one. If I set for the property org.apache.cxf.ws.address with gw ip of my machine (that is configured with a private ip) jetty throws an exception related to the specified ip address.